Now, digital technologies are gradually entering the construction industry, changing how infrastructure, real estate and other built assets are designed, constructed, operated and maintained. Those technologies include building information modeling (BIM), prefabrication, wireless sensors, automated and robotic equipment, and 3D-printing. The econonic and social impact could be substantial, as the construction industry accounts for 6% of global GDP and employs more than 100 million people worldwide. Within 10 years, full-scale digitization could help the industry save an estimated 12-20%, equal to between $1 trillion and $1.7 trillion annually, according to The Boston Consulting Group. In parallel to the new technologies, there are several global megatrends that urge players in the construction industry to rethink long-established practices. Among the most impactful are fast urbanization, climate change, resource scarcity and a growing talent gap. The last of these is especially pressing. Already today, more than two-thirds of American contractors have difficulties filling key positions, while in the UK construction sector, hard-to-fill vacancies have more than doubled over the past five years. In other countries the talent gap is expected to grow further, given the imminent digital transformation of the industry and the new skills it will require. • Building in a virtual world. 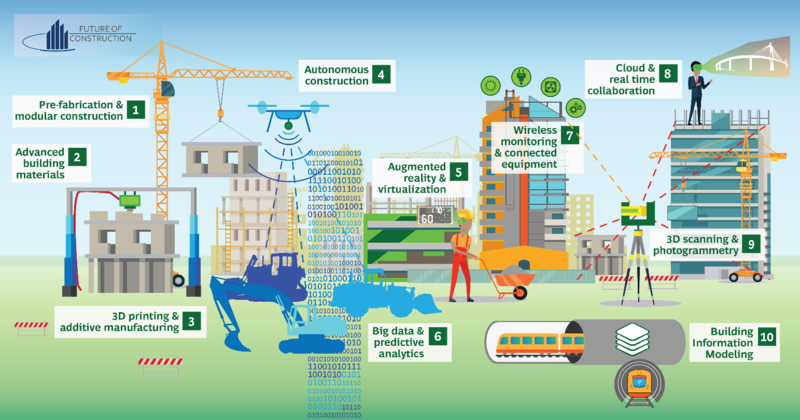 Artificial intelligence (AI), software systems and autonomous construction equipment replace most manual work throughout the engineering and construction value chain. • Factories run the world. Construction activities move largely to factories and the industry uses lean principles and advanced manufacturing processes to pre-fabricate modules that are later assembled on-site. • A green reboot. The construction industry uses sustainable technologies and new materials to meet tough environmental regulations. It is still unclear which route construction will take, and very likely that the future will include elements of all three scenarios. Current business models, strategies and capabilities will not be sufficient in any of these future worlds. This underscores the fact that players along the construction value chain need to prepare strategically. Many proposed actions relate only to a particular scenario, but six key actions will be relevant in any possible future. • Attract new talent and build up required skills – as any future scenario requires talent with substantially different skills than today's workforce possesses, and adequate upskilling processes are largely not in place. • Integrate and collaborate across the construction industry’s value chain – as the construction industry is characterized by a disintegrated and highly fragmented value chain, which hampers the seamless data flows and integrated systems that are essential in any future scenario. • Adopt advanced technologies at scale – as the construction industry has been slow to adopt new technologies and still heavily relies on manual labour and mechanical technologies, resulting in poor productivity. Further key actions are: to maximize the use of data and digital models throughout processes; to review existing product portfolios and embrace new business opportunities; and to enable change-management and adaptiveness. What’s the key to sustainable construction? The construction industry’s decision-makers need to understand the disruptions outlined in the future scenarios as wake-up call, and use the identified key actions as a foundation for companies to prepare and shape a prosperous future which allows them to fulfill their role in promoting economic growth, social progress and environmental responsibility.